Italy's production of olive oil fell to a 25-year low of 185,000 tons last year -- a more than 57 percent drop in quantity from the preceding year. The need for innovations is dire: the decline in production is threatening thousands of businesses and causing a huge loss of jobs, especially in the southern regions. And, now that olive oil is produced successfully outside the Mediterranean, Italy's market share is at risk. 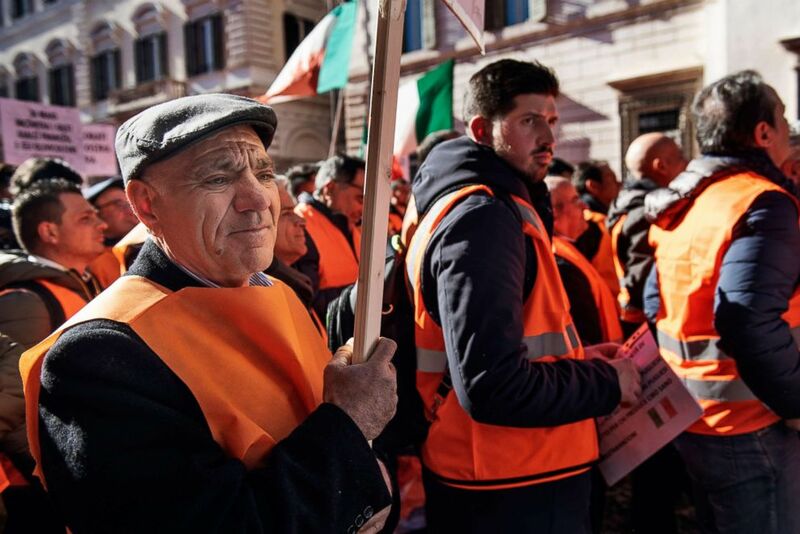 Men wearing orange vests march in an olive-growers protest in Rome, Feb. 14, 2018, to demand urgent measures in favor of olive oil producers impacted by hard frosts and Xylella, an olive tree disease. More drastically, though, down in the Puglia region, which produces about half of Italy's olive oil, the bacteria Xylella fastidiosa -- transmitted by insects and aided by the use of weed killer -- is killing thousands of olive trees, including ancient, monumental ones. 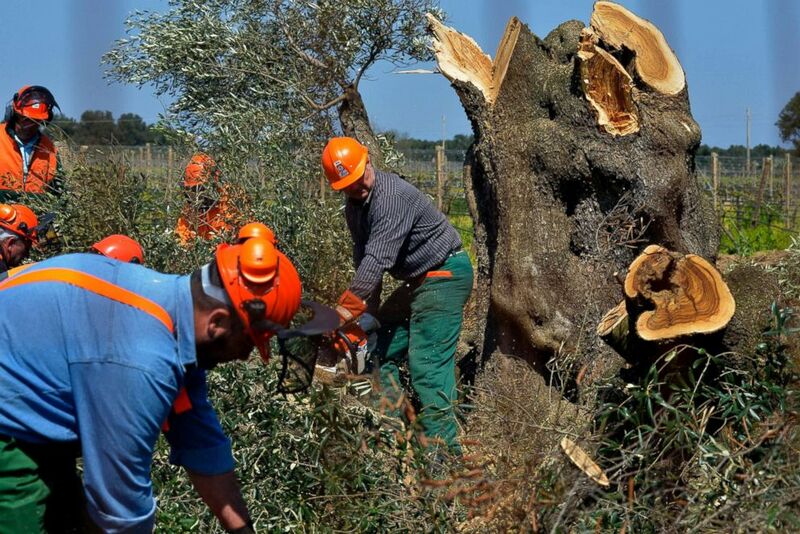 Workers cut down an olive tree in Oria, near Brindisi, southern Italy, April 13, 2015. Forestry officials in southern Italy cut down thousands of olive trees infected with a deadly bacteria in an attempt to prevent its spread. With 80 percent of Italy's high-quality olive oil sold abroad, these producers are attempting to carve out a niche in the worldwide business, seeing top quality, distinctive products as the future. "We are making an even better oil than that produced by our forefathers," Nicola Di Noia, Coldiretti olive oil expert, told ABC News. "Our olive oil must become the Ferrari of olive oil production." Coldiretti farm lobby olive oil expert Nicola Di Noia smells an olive oil bottle during an interview with the Associated Press in Rome, Feb. 15, 2017. "Temperatures have risen greatly over the years, and as we pick olives earlier now, we try to avoid picking them above 15 degrees centigrade so as to avoid the enzymes from modifying and fermentation starting," owner Lorenzo Fasola Bologna tells ABC News. "The results were spectacular with an increase in polyphenols [which improves health benefits]." 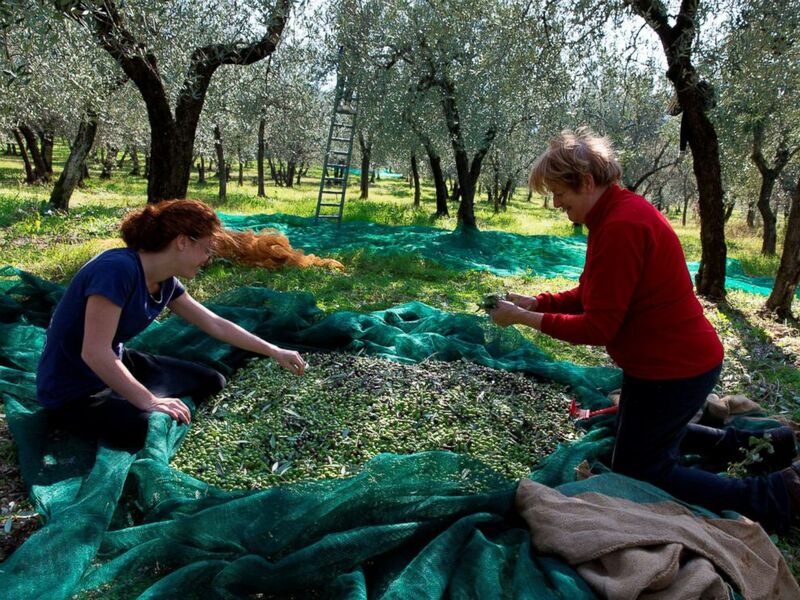 People harvest olives from trees using rakes, north of Rome, circa 2013. "What this means," says Fasola Bologna, "is that the consumer knows exactly where our olives come from and that the product comes from the Umbrian region of Italy." People harvest olives in the Umbria region of Italy, Sept. 18, 2017. Johnny Madge, an Englishman and olive oil expert who lives in Italy, told ABC News he believes Italy will become the most exciting producer of olive oil because of the wide variety of olives -- there are over 600 varieties Italy, more than any other country in the world -- and use of new technology, especially in olive milling. "The new technology means that we can now 'hear' each different olive variety in a way we never could before," Madge said. "They are now 'expressed;' before they were 'muffled' as olives were picked too late, milled too long after picking, and old dirty mills were used." He added, "These mills make oils of character because they use great cleaning technology, work at low temperatures with minimal friction and oxidization, and are filtered immediately rather than using separators that stress the oil." 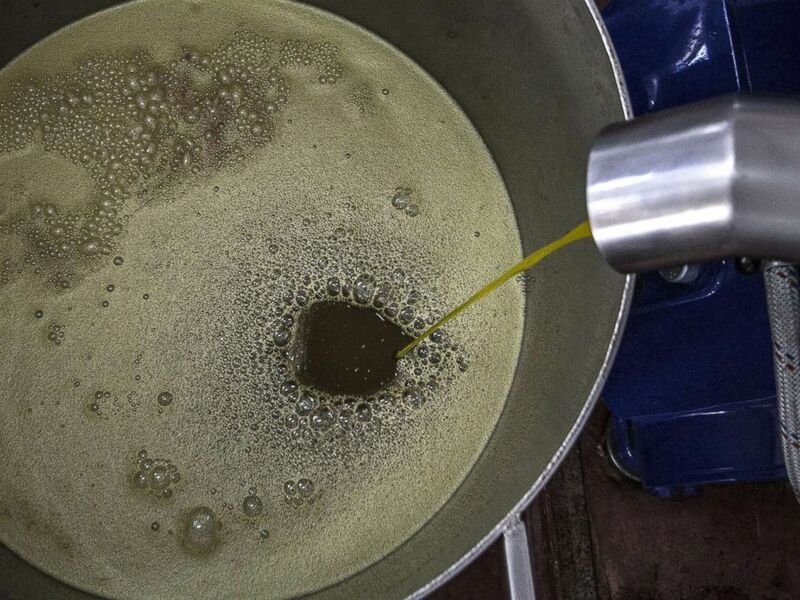 Olive oil is produced in an oil mill in San Pietro Vernotico in the Puglia region of Italy, Nov. 2, 2013. "Other EU countries, like Spain, produce oil that costs even less than half what Italian olive oil costs, and Spain can produce five to six times the quantity," he told ABC News. "[So,] the new trend in Italy is to focus on quality and stimulate the consumer to want higher quality olive oil. ... The challenge is to see if Italy will be able to continue to produce the quality at reasonable prices." "People have learned the difference between a carton of wine and a bottle of Barolo," he said. "The same has to be done with olive oil." 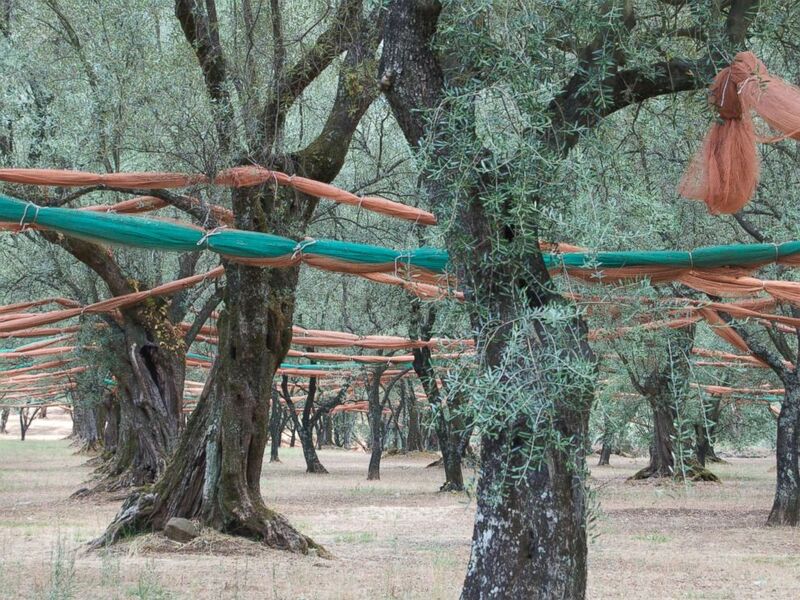 Olive trees are strung with netting in Calabria, Italy, August 2012. In the meantime, producer Ambrosio said, the goal is to "try to make oils that are balanced like a musical symphony." 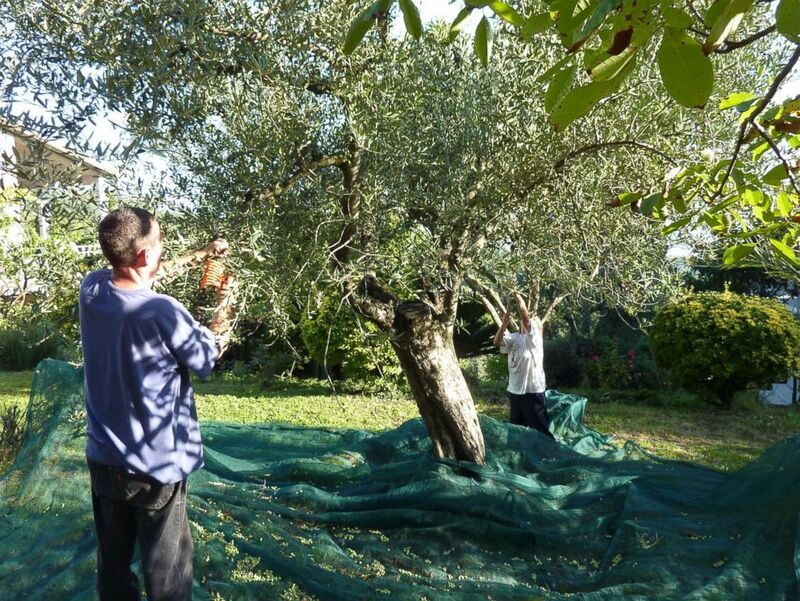 He is certain that when the quality of the olives picked is perfect, that is not difficult. ABC News' Alexandra Svokos contributed to this report.